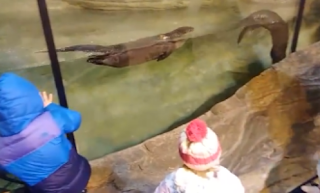 Tots checking out the otters. One of my favorites! In true dance-mom (gulp) fashion, I planned an outing to the zoo last Friday (and when it snowed that morning, we pressed on like the zoo-lovers that we are) with the tykes. Curly brought her BFF. Both girls love babies and they still enjoy the zoo. A win-win. Curly was going to require a relaxing treat considering that I had just booked for her three private lessons over her long weekend. She kept arguing with me that it was her weekend off. Um, Curly has gone thru a growth spurt and as a result is struggling a bit to keep her body from wobbling (while dancing . . . that was implied, right? I mean, the kid is tall, but she CAN walk). To begin with my kid is several inches, if not a full head taller, than most of the other dancers her age. And with a late December birthday, she is one of the youngest girls in her age group: cut off Jan 1. Some might argue that those long legs would wow the judges in competition. Well, if those long legs aren't in control and there is so damn much of them to see, then the judges are gonna notice. Oh, how I don't wish to be a dance mom, but I have been down this path before. I know how hard it is to pick a disappointed kid up off the floor and put the pieces of her broken heart back together again. Last year Curly placed 4th. In the Midwest. It was huge. Don't think for a minute though that I was not keenly aware of the flip-side. There really is no where to go from there. The top three places are fairly locked in by three amazing dancers. I just hope that Curly is happy with her placement on the 25th. After the zoo, the crazy bus driven by my crazy-dance-mom-self drove the long way home (as in the wrong direction, but hey we were already out and the smalls were already buckled in car-seats). I dropped Curly at the studio. I spoon-fed the baby her lunch in the indoor children's play zoo. I passed out the other lunches on paper plates and assigned Curly the task of breaking off bites of food to hand to the 16 month old. It worked great that a few of the kids I normally sit for, didn't come that day. The 4.5 yr old shared that he didn't want to eat lunch in the car. He would like to eat at home. 'Oh, I didn't ask you where you want to eat.' Love this guy, but he also exclusively drinks chocolate milk. Translation: at my house he drinks water. I don't jump thru hoops, peeps. I often distribute lunch in the car, because it saves time. Do you want more time to see the cute baby orangutan, or do you want to leave early so you can eat at my kitchen table? Work with me, damn it. Besides, we were being re-routed to the dance studio, so it was going to be awhile before we were home. The night before all of this went down, Ed came home from practice and informed me that his basketball practice time changed. Sure, why the Hell not?! He could no longer drive to the studio to get Curly after her lesson at 3:30. I cancelled the haircut I needed so desperately, and asked the moms I sit for to pick up as soon as they possibly could because Curly was at a dance lesson waiting for meSo Curly's two hour dance lesson, morphed into 3 hours by the time my shaggy, bad-haired self arrived to pick her up.